An exhaustive and comprehensive post. 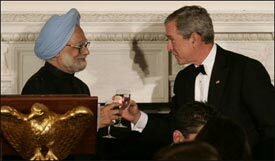 The burgeoning relationship between India and the U.S. is definitely one of the successes of the Bush Administration. But while the U.S. and India will get closer, they will not be “allies” in the traditional sense. The U.S., because of its force projection capabilities, sends its troops overseas with great frequency. India only sends its troops overseas under a UN peacekeeping mission, such as in a number of African nations. Naval cooperation may be an area of greater promise, since India is looking to expand its naval capabilities. Naval cooperation is also considered less risky to any Indian government. But I think the idea that the Arab world will look to India as an example of how to modernize is hopeful folly. Arabs, even secular ones, have tended to view Indians with contempt. And even with India’s achievements in IT, entertainment, pharmaceuticals, Arab reaction is more likely to be one of incredulence than admiration. While many Indians work in the Middle East, from drivers to cooks (in Saudi Arabia) to managing hotels and banks (Dubai) – few Arabs travel to India, either for business or leisure. Maybe too many Israelis are backpacking through India after serving their time in the military for their tastes. The one nation in the ME that India may have a moderating effect on is Iran. India and Iran have had interactions that date back centuries. India has become a popular vacation destination for young Iranians with money. India has the second largest Shia population after Iran. But for Iran to be tamed requires not just outside pressure, but the government in Tehran must be accountable to its people – right now it is not. There have been a number of exhaustive reports on India recently. Business week had a cover story on China and India. The Center for Strategic and International Studies recent prepared a brief on the Singh visit. And the Wharton School of Business had a report on the changing nature of R&D spending in India, and the opportunities for American firms. Pushing indian political democracy model against chinese communist model in Asia is not a new idea. JFK as a senator had argued that. There will not be any alliance between india and US. India did support refering iran being reccomended to security council over the developmet of nuclear weapon but its a mute issue. To the iranians india appears as another nuclear weapon state which wants to keep weapons out of their hand. Indians also know this fact and will only go so far in condeming iran. US does not want to give India a security council permanent membership. For the most part i dont see how this effects india at all. Its psychological to some extent. US wants to sell indians weapons, Indians want technology transfer. All US will offer is sale of weapons and coproduction of nonsensitve technology. For the most part india will be an important econmomic and trading partner rather than an allied power like us australia or even japan. Raising india as a counter weight to china is counterproductive and is only raised by indians for the mostpart. India has a secret desire to surpass china in all fields. Why would US want to replace india with china especialy when india and US will not see eye to eye on many issues. Even Manmohan singh when asked his view on iraqi involvement in his press club interview said that that the invasion of iraq was a mistake. You wrote on this website: "The author emphasized democracy as being some ideal that binds the countries but that’s not that important for the Americans and Indians rightly have no real illusions about it. All one would have to do is to look at their past alliances with Shah of Iran, Saddam Hussein, and of course Pakistan when they thought its in their short term interests." On my site you ask "Why would US want to replace India with China when India and US will not see eye to eye on many issues?" I know a good deal of American western allies that don't see eye to eye. "We are led, by events and common sense, to one conclusion: The survival of liberty in our land increasingly depends on the success of liberty in other lands. The best hope for peace in our world is the expansion of freedom in all the world. This speech is not platitudes, it is US foreign policy being conducted by Sec. Rice around the world. The US no longer coddles dictators for it produces more Sept 11 attacks. That is why the US offers to India are sincere. The US is very interested in long term relationships with democratic countries. It is in both nations interests to promote better ties, stronger economic growth and more importantly, democratic principals abroad. I raised on the other site.